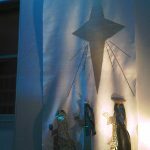 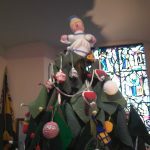 The star of the show at St Columba’s Festival of Light was a seven foot tall knitted Christmas Tree. 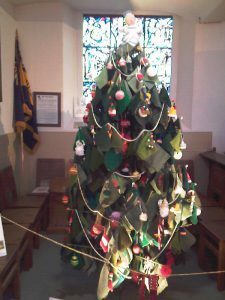 It had taken months of work to knit hundreds of woollen squares of different shades of green, which were hung on a wooden frame of branches. 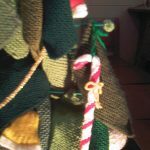 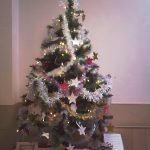 The tree also featured knitted baubles, ornaments, toys, tinsel and lights. 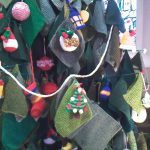 St Columba’s ladies’ group, HANDS (an acronym for Here And Now Doing Something), plans to reassemble the 900 woollen squares into 22 blankets to be distributed to humanitarian aid through Inner Wheel after Christmas. 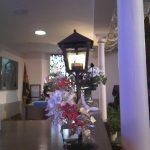 The Festival of Light was timed to coincide with North Shields’ annual Victorian Christmas Market on 8-9 December in Northumberland Square in front of the church. 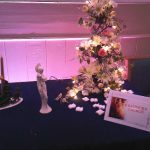 The festival exhibited diverse seasonal displays, and lighting effects in the church. 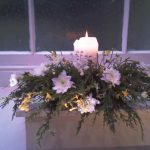 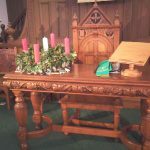 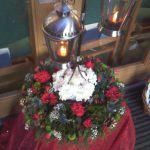 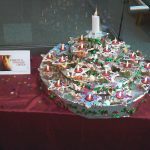 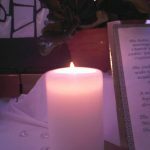 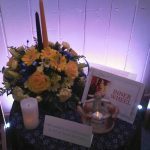 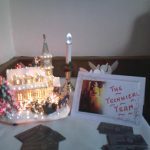 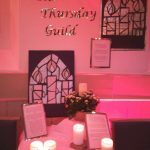 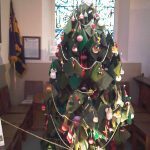 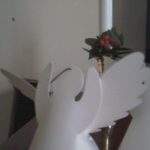 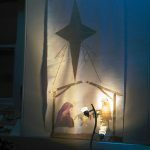 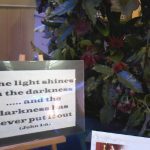 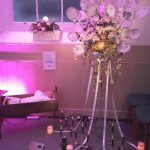 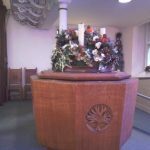 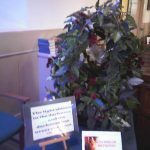 The displays were provided by local churches and charities, a local flower shop, and various groups from within St Columba’s. 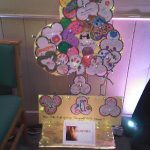 The Brownies had imaginatively designed a tree made up of trefoil leaves which they had coloured in with their own names. 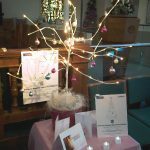 There was also a prayer tree, and visitors were invited to write short prayers on stars which were then hung on the branches. 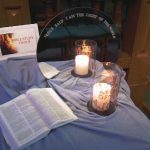 The Sunday morning service featured a sketch based on the pantomime Aladdin, which also picked up the theme of travelling from darkness into light, and the church’s developing vision to reflect the light of Jesus in its work within the local community. 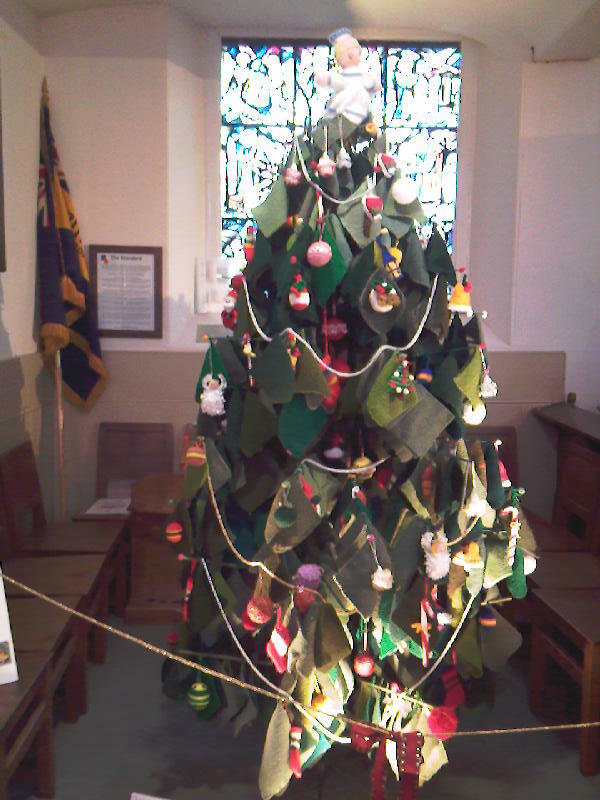 The church hall also had a busy weekend serving refreshments, and selling handicrafts and fairly traded goods. 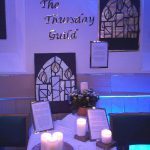 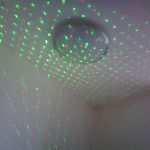 The whole event raised hundreds of pounds for church funds and for a local charity long-supported by St Columba’s, the Tynemouth Blind Welfare Society.